Frances Otis: Oh, I thought you were in trouble. Harold Diddlebock: Far from it! Do I look as if I were in trouble? Now, you didn't happen to see any bankers downstairs, on your way up here, did you? Frances Otis: No, I didn't Mr. Diddlebock. Only a colored man. Harold Diddlebock: What was he doing? Frances Otis: Mopping the floor. Harold Lloyd and Preston Sturges are in the same boat, really. In their respective times, they were beloved stars. Now, the rank and file don't really remember them, or if they do remember them it's for a limited selection of films which don't necessarily reflect their full bodies of work. For Lloyd, audiences really only know him as the guy who's always hanging from the clock in the Chuck Workman montages that pop up during award shows, no concept at all that he was, in his time, far more successful than Buster Keaton and on the same level as Chaplin. And for Sturges, only filmlovers really remember him, even though the best of his films, like Palm Beach Story and Sullivan's Travels are among the very best of their time. Lloyd, of course, was a silent comedy icon. After the depression is career slumped and while he made a series of largely unsuccessful sound films trying to maintain the verve of his silent comedies, audiences simply were not interested. 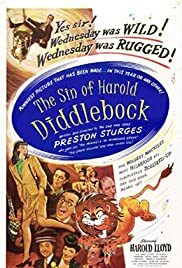 In 1947, though, he attempted another comeback in the film The Sins of Harold Diddlebock. Directed by Preston Sturges, Diddlebock capitalized on Lloyd's past rather than avoiding it. The film took the interesting question "What happened to Harold Lamb (Lloyd's character from The Freshman, his most popular silent film) after the Depression?" In doing so, the film also examined what happened to Lloyd's image. Diddlebock opens with the final 10 minutes of The Freshman, the triumphant football game. Shifting to sound almost immediately after the final whistle, Lloyd's character goes from youthful exuberance to aged desperation. Following the game, we discover, Harold took a bookkeeping job at an ad agency hoping to move straight to the top. Like his character in Safety Last (the classic where he hangs from that big clock) all he wanted was the chance to pitch his one great idea. But that chance never came and nearly twenty years after he lost his savings in the Crash, Harold loses his job as well. Grey haired, face set in wrinkles, Harold goes into the world with only a small pension. But with the help of a night of drinking, a horse named after his aunt, a look-alike sister played by Margaret Hamilton (the Wicked Witch of the West), and an old boozehound named Worm, he reclaims his comic genius, briefly owns a circus with 37 lions, and, well, perhaps you can see where this late screwball comedy is going. Diddlebock went nearly a million dollars over budget and was reedited and renamed (to Mad Wednesday). It was a disaster. Looking at the film objectively, many years later, it certainly isn't so bad. The central stylistic conceit is that the silent slapstick of Lloyd's age and the verbal acrobatics that made Sturges famous were not so different at all. Sturges goes so far as to change Lloyd's character's name from "Lamb" to "Diddlebock" to create a slapstick of nomenclature. Diddlebock also proves fairly conclusively that Lloyd's decline was not caused by an inability to handle speaking roles. In this film he keeps up his end of the witty repartee and even harmonizes in a chorus of "Auld Lang Syne." The film also pays homage to Safety Last's human fly scene with a skyscraper chase scene involving Lloyd and a lion. Even at 53, Lloyd was still fit enough to handle the stunts, including swinging upside down from a leash. And yet, for all of its charm, Diddlebock must have seemed out of place. By that point audiences probably didn't remember Lloyd and didn't want to remember the Depression. The problem is that the film is just a little too clunky and, like the worst of Sturges's writing, relies largely on expositional monologues to justify plot contrivances. Also, the film just doesn't have the zip that Sturges's films had at their peak. Still, it's a pleasant combination of elements, capitalizing on Lloyd's considerable personal appeal, Sturges's talent (even low Sturges is better than, well, most things), and several members of Sturges's stock troupe, including Jimmy Conlin as drunk gambler Wormy. The fact that audiences of the time rejected it shouldn't have any impact on people with unjaded eyes viewing it today. Look for the 90 minute version, by the way. I'd give Harold Diddlebock a 7 out of 10. It's worth a look if you're a fan of either Lloyd or Sturges.